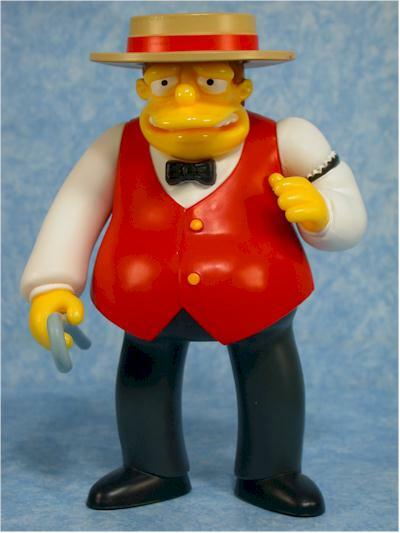 The fourth Be Sharp figure - Barney - should be hitting mail boxes any day! 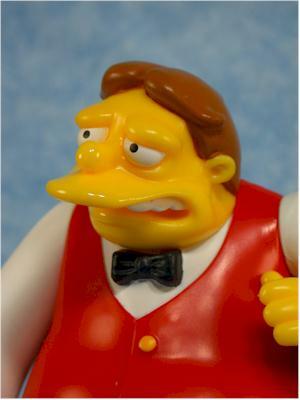 He joins his three quartet members Homer, Apu and Skinner to form the complete group. You can still get your Barney by sending in your POPS from four wave 13 figures, along with five bucks, to the redemption center. There's a form inside every wave 13 figure with the address and details, along with a little figure survey. There is also a very cool Be Sharps Playset coming out in the next two months. It's currently available for pre-order at Amazon, but don't dally if you think you want it - the Treehouse of Horror number 4 (with the Collector) went up for pre-order at Amazon at the same time, and is now already sold out! These sturdy little boxes - well, not quite so little in Barney's case of course - are really terrific. Collector friendly, easy to store, and they hold up very nicely. 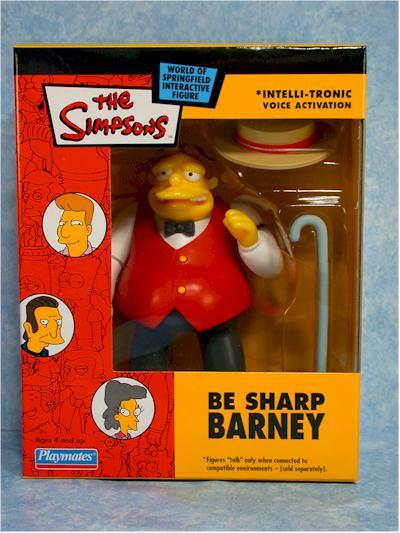 The Barney sculpt isn't my favorite out of the overall Be Sharp's set, but it's not terrible either. He's not quite as expressive as some of the other members, and I really wish his left hand had been sculpted to hold his hat in front of him. Still, he doesn't suffer from zombification, and the scale is good. He also stands just peachy on his own. 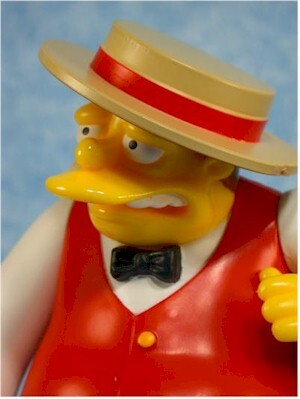 Sometime paint application is hit or miss with the World of Springfield, but fortunately it was a hit with my figure. I've only seen this one so far, but I hope that it's consistently good across the run. All the colors are clean and consistent, and the white doesn't show any other color through it. The details are neat, and the most important feature - the colors across the set of four - are also consistent. Thank goodness they didn't get a slightly different batch of red half way through. 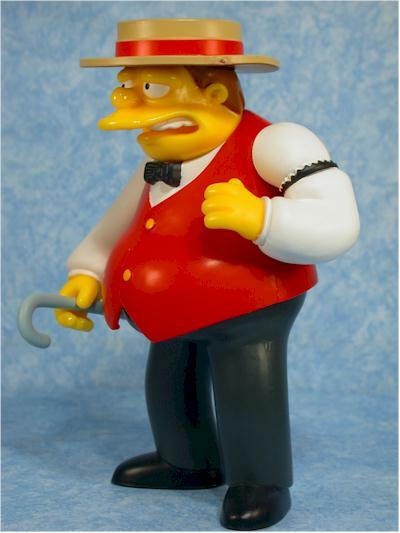 Barney, just like the rest of the series, comes with a cane and a hat. Both look good, with nice paint ops and good sculpts The hat fits easily, and he can hold the cane without too much trouble. If you're like me, this figure is really only costing you $5 for shipping. That's because you were buying a set of wave 13 figures to open anyway. You just can't get a better deal than that. On the other hand, if you are a MOCer, you had to buy four figures just to get this one, which drives the cost to you up to at least $25. That's getting steep, even for any sort of exclusive. Since this really only plays the lines any other Barney figure plays, it's not really the talking feature that's going to sell you on him. This score will also jump once the Be Sharps playset is shipping. As an independent figure, Barney isn't going to be in my top 10 of all time best WOS. He is good, and certainly eye catching, but his real appeal, and the real appeal of Homer, Skinner and Apu, is as a set. Set them all together, and their cool factor jumps. It's great to have a consistent looking pack like this, and I'm looking forward to getting the Be Sharps playset to hear them sing! Pick up your series 13 figures, send in those POPS along with five bucks, and you'll have one for yourself! 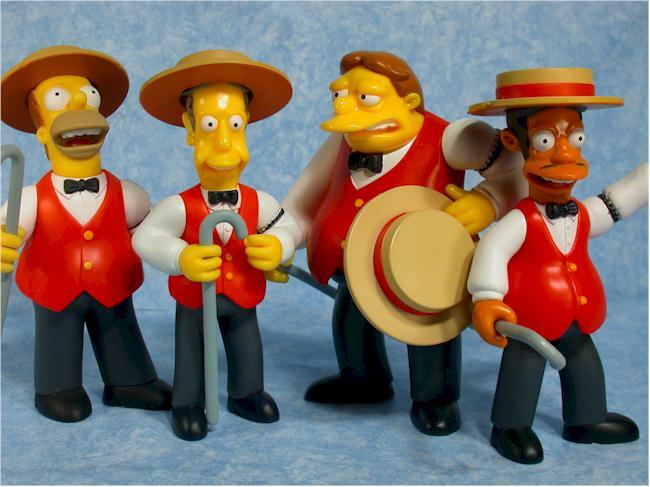 Also, don't forget that you can pre-order the Be Sharps Playset at Amazon.com now.